:Roma Downey and Mark Burnett's epic television event A.D. The Bible Continues captures all the political intrigue, religious persecution, and emotional turmoil of the founding of the early church in spectacular fashion. Now, in this official companion book to the television event, exclusive photography and inspirational Scripture celebrate the sacrifice and the triumph of the early disciples in stunning, vibrant detail. The perfect complement to the television event, this breathtaking photographic keepsake presents readers with a front-row seat to the one of the most extraordinary eras in world history. 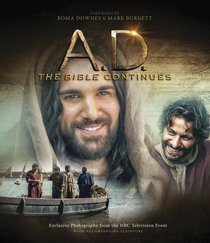 About "A.D. the Bible Continues"